The very thought of appearing before the judgment seat of God is enough to cause even the most “righteous” believer to tremble. As a young child I remember hearing of the judgment of God in Sunday school. At a very early age I determined to live an honorable life in hopes that I could avoid having to face God and give an account of my sins. I knew early on that I was a sinner and I was pretty sure God was going to throw the book at me. As hard as I tried I always seemed to miss the mark. I never seemed to do the things I should like pray and read my Bible every day but I always seemed to find time to get into trouble. I, Pam had every reason to fear the judgment of God….or so I thought. The problem was I had not yet studied the Word of God and I didn’t have enough“information” about the judgments of God and I had no “revelation“ of the love of God. I spent my childhood worried that God was sitting up in Heaven just waiting for the day of my arrival and would be delighted to toss a young child like me into a fiery hell. It seemed I knew so much about the “law” of God but very little about the “love” of God. When I began to study God’s Word for myself I read about how God loved sinners like me so much that He sent His own Son to die and take my punishment. I received a revelation of His great love. I read about how God has my best interests at heart. He has good plans for me. I know now that God is my Father and He loves me. I do not fear the judgment of God. Let me explain. There are two different judgments in the Word of God. The first is the judgement of the unbelievers called the “great white throne judgment” The second is “the judgment seat of Christ, called the Bema” where believers are judged and rewarded. The great white throne judgment is not a judgment of sinners because we are all sinners. It is a judgment of ‘unbelievers’ who have rejected Christ and the Cross. This judgment is much like you would picture a court room setting where punishments and sentencing take place. The judgment seat of Christ is the judgment of believers and this setting is more like an Olympic stadium where events are judged and different rewards are presented. The word BEMA actually means “elevated or raised” platform. 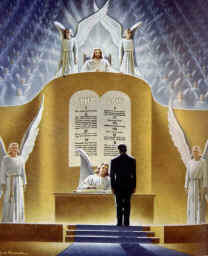 To appear at the judgment seat of Christ is going to be wonderful. If you have received Jesus Christ into your heart and life you should not fear future judgment. Your sins are forgiven. You are a child of God. You are a believer. You are not perfect, you are forgiven. Some years ago an individual was attempting to threaten me by saying, “God is going to judge you one day.” I simply smiled and said, “I would much rather have God judge me than you, my friend.” You see, I understand that the judge is my loving Father. He loves me. He adores me. He is preparing a place for me in Heaven. I no longer believe the lies of the enemy. I am looking forward to seeing my Father in Heaven and I’m going to jump straight into His arms of love. What a day that will be!! !